The index opened weak and went on to touch the lows of the day within the first few minutes but smart buying saw the index close flat at 7733.45, small loss of 2.05 points. The broader market was also negative with 675 advances to 857 declines. Range for the series now at 7500-8000. 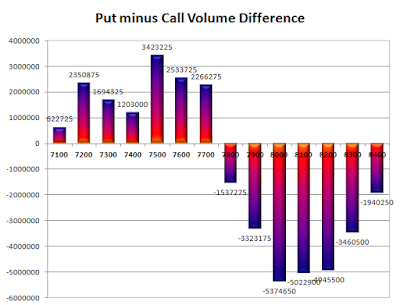 Call option 7700-8000, 8300 added huge 33.00 lacs OI with small profit booking seen at 8100 and 8200 strike prices. 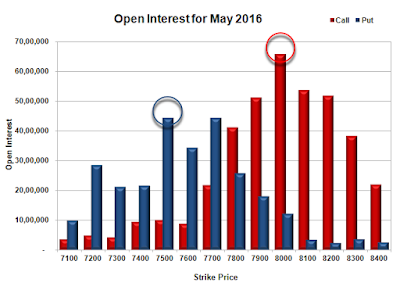 Put option 7700-7500 added 6.97 lacs OI with short covering seen at 7800 and above strike prices. Nifty Open Interest is at 1,76,08,650 down by 6,44,250, with no change in price, most probably huge long liquidation/short covering. Bank Nifty Open Interest is at 16,79,700 up by 16,200, with increase in price, most probably long build-up. FII’s sold 17430 contracts of Index Futures, which includes net 11163 contracts long liquidation and 6267 contracts short build-up, with decrease in net OI by 4896 contracts, includes 14116 longs to 31546 shorts for the day. FII’s Index future open contract as on date is 141177 Longs to 95019 Shorts, Net 46158 down by 17430 contracts. 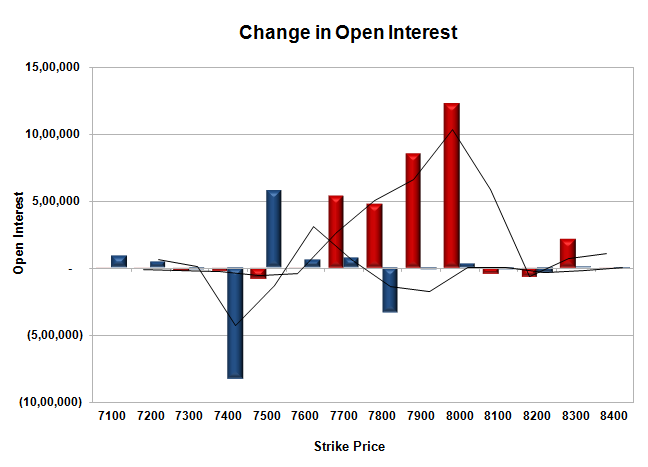 Initial and best support still at 7700, with OI of 44.44 lacs and below that at 7600 with OI of 34.27 lacs. 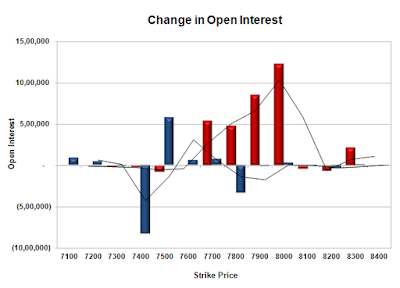 Initial resistance at 7800, with OI of 41.14 lacs and above that at 7900 with OI of 51.29 lacs. Day Range as per Option Table is 7657 - 7790 and as per VIX is 7665 - 7802 with 7717 as the Pivot.